Rugby Australia have announced they plan to terminate Israel Folau's contract following his anti-LGBT comments on social media. The devout Christian posted a message on his Instagram account on Wednesday, which read: "Warning. Drunks, homosexuals, adulterers, liars, fornicators, thieves, atheists, idolators. Hell awaits you. Repent! Only Jesus saves." He also took to Twitter to criticise Tasmania's decision to become Australia's first state to make it legally optional to list gender on birth certificates, posting that "the devil has blinded so many people in this world". Rugby Australia confirmed on Wednesday they were investigating Folau's remarks but have since been unable to contact him. Rugby Australia chief executive Raelene Castle and her Waratahs equivalent Andrew Hore said in a joint statement they decided to terminate Folau's contract "in the absence of compelling mitigating factors". "Rugby Australia and the New South Wales Rugby Union have made repeated attempts to contact Israel both directly and via his representatives since 6.30pm on Wednesday, and at this point he has failed to communicate directly with either organisation," Rugby Australia said in a statement. Folau, who has won 73 caps, would have been a key part of Australia head coach Michael Cheika's World Cup plans this year. Last weekend, he broke the Super Rugby try-scoring record as he scored his 60th for the Waratahs in the competition, breaking the record of former New Zealand winger Doug Howlett. The 30-year-old former rugby league international signed a new deal with Rugby Australia in February which was set to run until 2022. Folau posted similar comments last year, saying God's plan for LGBT people was "HELL.. Unless they repent of their sins and turn to God". In the wake of those remarks, he met with Castle and Hore but he was not formally sanctioned. He subsequently wrote an article for PlayersVoice in which he stated: "I believe in inclusion. In my heart, I know I do not have any phobia towards anyone." He also offered to quit playing rugby union for his country. "During the meeting I told them it was never my intention to hurt anyone with the Instagram comment, but that I could never shy away from who I am, or what I believe," he wrote. "I told them if they felt the situation had become untenable - that I was hurting Rugby Australia, its sponsors and the Australian rugby community to such a degree that things couldn't be worked through - I would walk away from my contract, immediately." Former Wales rugby player Gareth Thomas, who announced he was gay in 2009, wrote on Twitter that people should "not be influenced" by Folau's words and that he had "sympathy" for Folau. England international James Haskell wrote to Folau and said "sport has no place for this ... keep it to hate groups. You are an unreal player, but a ... misinformed bigot". Former England prop Joe Marler, who plays for Harlequins, mocked Folau by posting two images of men kissing. International Gay Rugby (IGR), the global organisation for the world's gay and inclusive rugby clubs, has welcomed the decision by Rugby Australia. "The decision by Rugby Australia and the NSW Rugby Union, today upholds rugby's core values of respect and sportsmanship," says IGR Chair, Ben Owen. "Rugby has become one of the most inclusive sports on the planet, where players, spectators and officials, regardless of their ability, race, age, sexual orientation or gender identity and expression can enjoy the game without fear of discrimination by others. 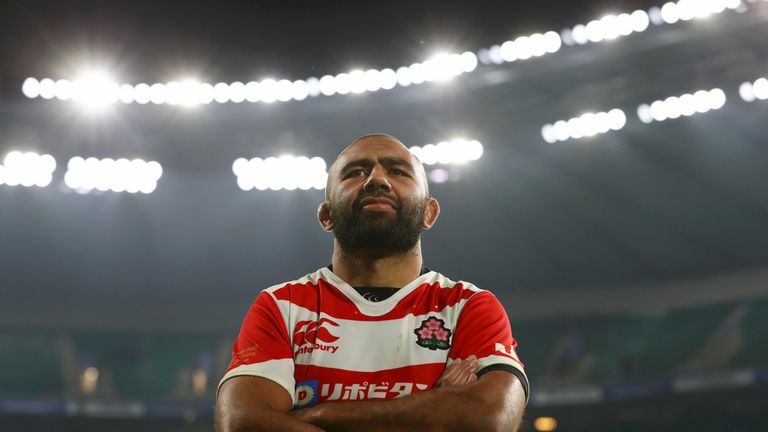 Japan captain Michael Leitch says Israel Folau’s anti-LGBT post is a “stab in the heart”. "When someone like Folau makes statements like this, it sends a message that members of the LGBT community are less-than and it can have irreparable harm. Britain-based LGBT charity Stonewall also supported Rugby Australia's move. "Folau's comments are just one example of how much work is still left to do to combat discrimination and the use of hateful language against lesbian, gay, bi and trans (gender) people," said Kirsty Clarke, the director of sport at Stonewall.